Fabric.js is a framework that makes it easy to work with HTML5 canvas element. It is an interactive object model on top of canvas element. It is also an SVG-to-canvas parser. 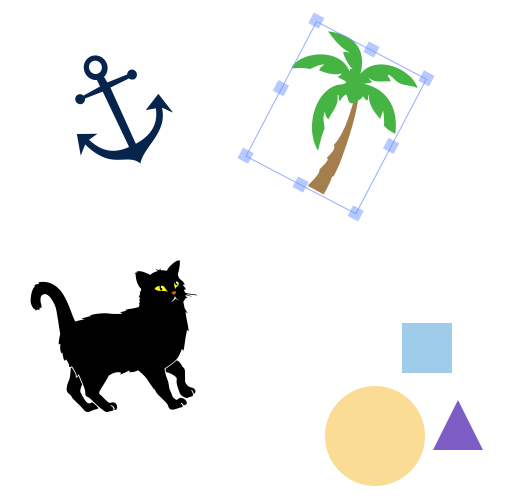 Using Fabric.js, you can create and populate objects on canvas; objects like simple geometrical shapes — rectangles, circles, ellipses, polygons, or more complex shapes consisting of hundreds or thousands of simple paths. You can then scale, move, and rotate these objects with the mouse; modify their properties — color, transparency, z-index, etc. You can also manipulate these objects altogether — grouping them with a simple mouse selection. Contributions are very much welcome! You can run automated unit tests right in the browser. To install Fabric.js using npm, you must first manually install Cairo on your system. Cairo is a system library which powers node-canvas, which Fabric.js relies on. When the installation is complete, you may need to restart your terminal or command prompt before installing fabric. 2.1 Or build a custom distribution file, by passing (comma separated) module names to be included. By default (when none of the modules are specified) only basic functionality is included. See the list of modules below for more information on each one of them. Note that default distribution has support for static canvases only. Create source map file for better productive debugging (requires uglify or google closure compiler). More information about source maps. If you use google closure compiler you have to add sourceMappingURL manually at the end of the minified file all.min.js (see issue https://code.google.com/p/closure-compiler/issues/detail?id=941). Documentation is always available at http://fabricjs.com/docs/. Also see official 4-part intro series, presentation from BK.js and presentation from Falsy Values for an overview of fabric.js, how it works, and its features. interaction — Adds support for interactive features of fabric — selecting/transforming objects/groups via mouse/touch devices. image_filters — Adds support for image filters, such as grayscale of white removal. node — Adds support for running fabric under node.js, with help of jsdom and node-canvas libraries. object_straightening — Adds support for rotating an object to one of 0, 90, 180, 270, etc. depending on which is angle is closer. Follow @fabric.js, @kangax or @AndreaBogazzi on twitter. Questions, suggestions — fabric.js on Google Groups. See Fabric questions on Stackoverflow, Fabric snippets on jsfiddle or codepen.io.